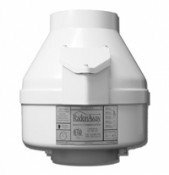 Installing the flashing for a through the roof radon pipe is often a great concern for many due to the potential for leaks. But as you will see below it's really not that difficult to install a flashing properly. Also on the minds of some is a fear of heights and rightly so as a fall from any roof is never a thrill and may kill! So without going in to lots of detail about safety...please be safe and if in doubt.... a handyman can be hired to perform this task for you. Decide where the fan will go in the attic and run the pipe. From your vertical section of pipe where the fan will mount use a plumb bob to find the center of the pipe on the underside of the roof deck. Drive a nail up through the shingles above. Note: Positioning the fan close to the roof deck cuts down on the amount of condensation that the fan has to deal with. 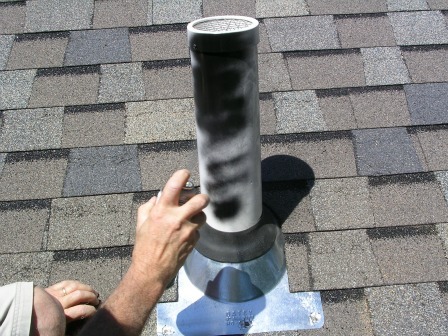 Insulating the pipe below the fan will help to reduce condensation also. We normally have no more than 24" pipe above a fan. Prepare to cut the hole in the roof. Notice the nail sticking up near my hand. Tip: A cushion is not an approved safety device, but they do help to keep a person from sliding off a steep roof. A second one is great to keep your tools on the roof. But a cushion will never replace a safety harness. I use a scrap of pipe and crayon for marking the hole. 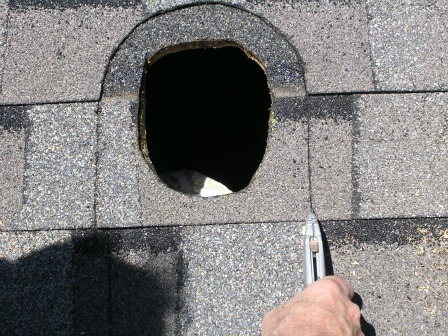 The hole needs to be about an 1" wider and depending on the roof pitch 1-3" wider on top and bottom. So the hole will end up being oval in shape. 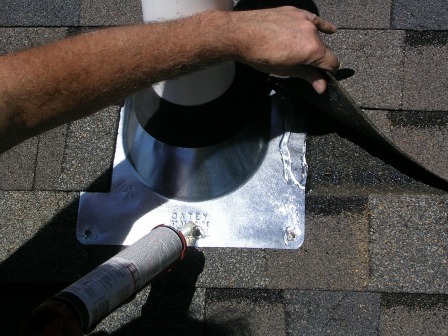 Before cutting be sure the pipe or if you have the fan installed is covered. A nail dropped in a fan can easily ruin the impeller when turned on. 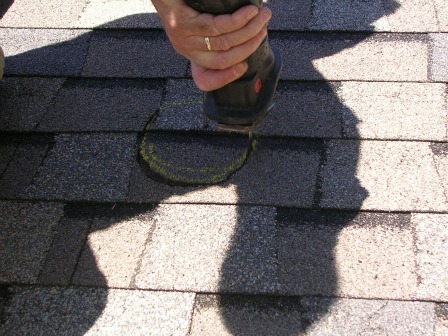 Now you need to carefully loosen all shingles at the glue strip with a flat pry bar. Laying the flashing over the over hole will also help you to see which nails need to be removed. In this situation nails found at the row where the pry bar is will need to be pulled and under the next row down. Note: You should end up with an oval shaped hole. This allows the pipe to come through the roof plumb. Now slip the flashing up under the the first row above the hole. With your eye or a plumb bob get the flashing squarely over the fan opening below.Now remove the piece following the curve of the flashing. Cut less to start with...then trim to perfection after the first piece is removed. 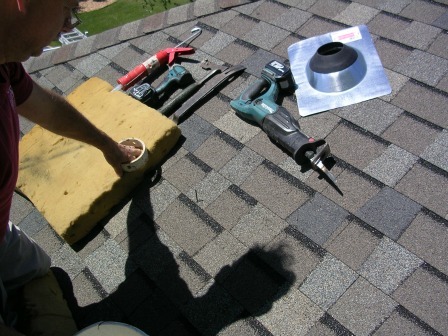 Tip: Tin snips work great on cold or old brittle shingles. 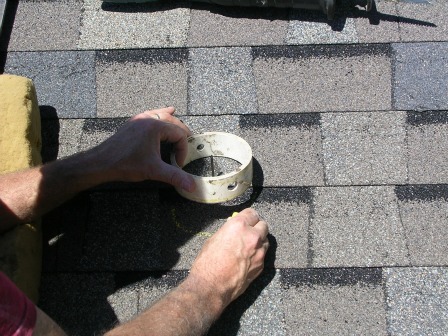 With the upper shingle properly cut use this as a pattern to cut the row below. 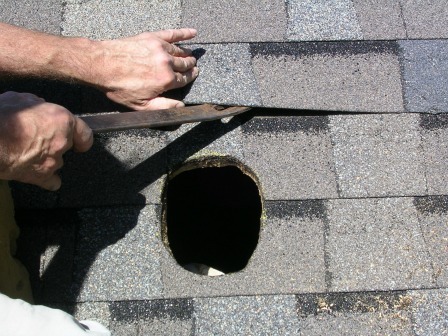 You will always want to remove at least parts of 2 rows so the majority of the sides of the flashing are up under the shingles. 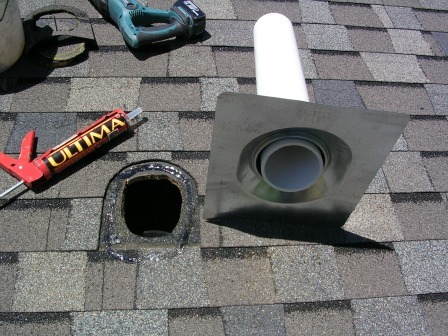 Using a good quality roof caulk, apply a thick bead around the entire hole. Cut a piece of pipe long enough to end up with at least 12" sticking up above the roof. Note: The rubber coupling on the top of the fan can be seen just a few inches below the roof deck. Insert the pipe into the flashing so it's flush with the bottom. 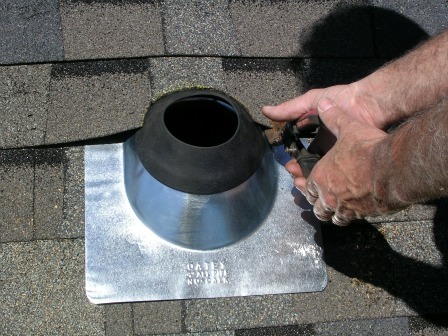 Now the flashing can be slipped up under the shingles. Try to hold it above the caulk as you slide it up. Use a helper down below to secure the rubber coupling as you help push the pipe into the coupling. 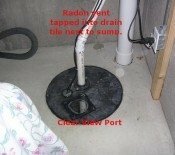 Before tightening the coupling make sure the radon vent is plumb. Nail the bottom edge of the flashing and add a couple more up under the shingles on the sides. I like to caulk up along the sides of the flashing where possible and under all loosened shingles, where nails were pulled, and any exposed nail heads. No need to go crazy with nails as the caulk below will hold the flashing in place also. Finally add the varmint guard to protect the fan from acorns, hailstones and critters. Painting the pipe a dark color will keep ice formation to a minimum during the winter.